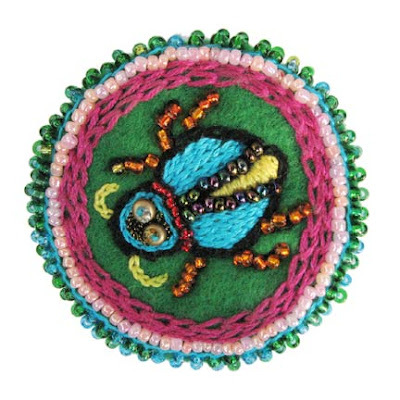 My work is predominantly beadweaving with some embroidered and painted elements thrown in. 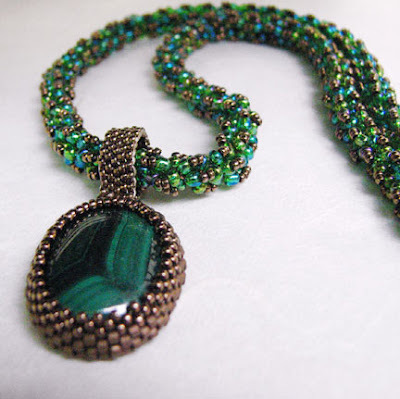 I do a little wire wrapping, but my main focus is on beadwork. 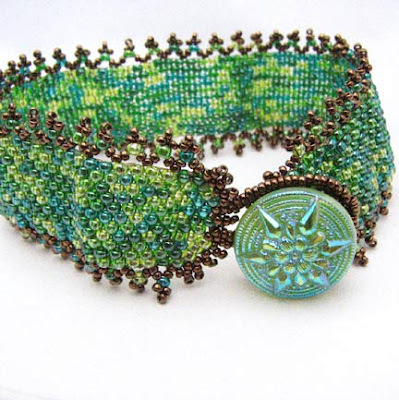 I am in love with tiny seed beads - the smaller the better. My business name is actually just a contrived name that my daughter picked out (she was 13 at the time.) I was going to use my own name but she wanted to be involved so I let her name my shop - and of course it does sound like my last name so it's not totally unrelated. My creative process is usually me thinking in the car, while I am doing other chores etc., and I get an inspiration - I might make a quick sketch or if I can run up to my studio and see what materials I have that might work for my idea. I have tons of beads and lots of broken old jewelry that I like to take apart and use pieces from. Sometimes I'll see a color combination somewhere that I like - like I recently bought a card with a Gustav Klimt image on the front and I loved the colors - he used a lot of golds in his painting mixed with jewel tones, and I love gold beads - as you can see from my work. I work in silence or sometimes with a movie playing on my laptop - I just listen, don't really watch. I work for a couple hours (usually 2) each night, and as much as I can during the weekends - I do have a full time job as a graphic artist so I can't spend as much time in my studio as I might like, but I enjoy my job as well - so I feel like I have the best of both worlds. I actually have a BFA in printmaking, which I no longer do, but I have always fooled around with sewing, embroidery and beading. When I was a kid, I used to make tiny little dolls with fancy clothes etc - I still have a box of them at home. I should try doing some more of those someday to see how my esthetic has changed. A tool I can't live without - extra sharp scissors, lots of needles, every color of Nymo thread possible. If I get frustrated I will look through my supplies since I often forget what is in the many tubs of beads and parts that populate my studio, and I will see something and have a moment of inspiration. My advice to artists would be to never regret trying something - I have taken apart many projects that just weren't panning out well- and if you mess up something, move on. 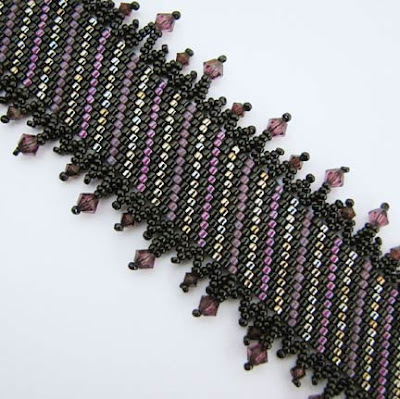 Yes it does stink when you ruin materials, but thankfully with small beads you're never ruining anything too expensive. I recently spilled a bunch of beads (size 15) and was able to rescue some, but I just had to vacuum a lot of them up as they were everywhere on the floor and they are so tiny. 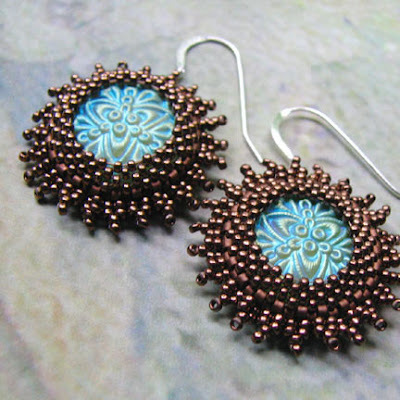 Also, I tried a new glue on a pair of bead embroidered earrings recently - I had made two beaded bezels for the Swarovski rivolis and then glued them to some suede leather with the intention of adding a nice picot edge. Well this glue was industrial strength and I should have known better, but it dried like cement and I couldn't get a needle through that leather to save my life. So then I thought, I'll just rescue the rivolis by cutting away the beaded bezels but they were stuck onto my fabric backing so well that when I tried to peel them off with a plier, I just chipped them terribly and they never did come off. So I threw the whole project away and will remember that more glue isn't necessarily a good thing and to not use that particular glue again. Like I said, you have to move on and not get too mad at yourself - it's a constant learning process. My favorite comfort food is chocolate of course - extra dark. Fabulous interview! 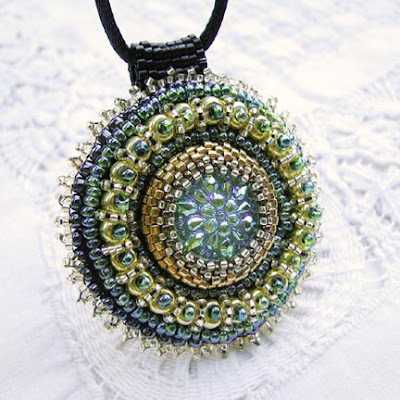 Sylvia is a good online friend and she creates so of the most beautiful pieces I've seen. The same attention goes into her customer service as well! 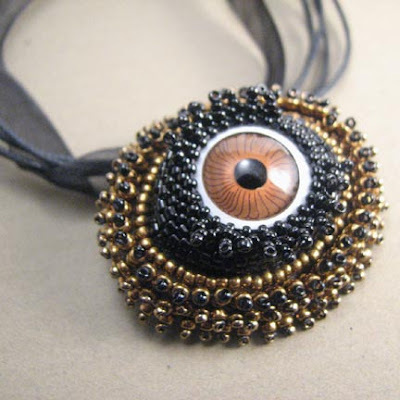 Thank you for featuring me - it was an honor and very exciting to see my work on your fantastic blog. Thanks again! It was truly my pleasure, Sylvia!